The Nike Air Max 95 Sneakerboot is said to be very sleek and stylish; in fact, a lot of wearers report getting a lot of compliments from friends and colleagues when they go out wearing this pair of kicks. According to several reviewers, this shoe is comfortable; some of them even say that this shoe is good for workouts. The Nike Air Max 95 Sneakerboot serves its purpose because a lot of wearers report that this shoe is effective in keeping their feet warm during harsh winters. Some purchasers think that this model really functions as a sneaker and a boot and that these two occupations are effectively integrated. Despite the bulky appearance, this pair of shoes is light according to some purchasers. Several buyers say that the Nike Air Max 95 Sneakerboot looks precisely like the way it appears in its online photos. There were a number of buyers who express their willingness to recommend this shoe to friends, colleagues, and family. Majority of those who left reviews gave the Nike Air Max 95 Sneakerboot high overall satisfaction scores. The durable and textured rubber outsole offers dependable grip on slippery surfaces, as shared by a couple of users. While it’s true that many love the stylishness of the Nike Air Max 95 Sneakerboot on feet, this men’s boot runs a little tight around the toes according to some. At least one reviewer thinks that this shoe is a little too expensive, but he says that it is indeed comfortable. The Nike Air Max 95 Sneakerboot looks and functions as promised. Several purchasers say that this AM 95 model effectively keeps their feet warm during winter. A good percentage of those who left reviews also love the stylishness of this shoe, adding that the compliments that they get when they’re in this shoe just feel so good. While the price is indeed on the higher end of the spectrum, the Nike Air Max 95 Sneakerboot effectively compensates for it by performing so well. The Swoosh brand transformed its old-school Air Max 95 running shoe into a modern-day utility foot gear structured into a half sneaker and half boot. The reimagined silhouette labeled as the Nike Air Max 95 Sneakerboot had an extended ankle collar that’s done in neoprene and zipped sleeve which takes up the shoe’s focal point. Before we tackle the different segments of the remastered silhouette, let’s have a quick dive into the storied past of this AM95, beginning with the first Air Max shoe release, the Air Max 1. The Centre Georges Pompidou in Paris has one of the most thought-provoking architectural designs in the modern world. While it’s fully functional, its unique design makes it look like it’s still under construction. Features that are supposedly hidden (e.g., beams and posts) or kept indoor (e.g., staircases) are purposefully laid bare for the whole world to examine. When Tinker Hatfield saw the Pompidou, he immediately recognized it as a good shoe inspiration. He toiled and subsequently pitched the idea of carving a window on the midsole so that the inner workings of the shoe--specifically the air packets that provide heel cushioning--will be visible. However, his proposal was initially met with animosity. Some colleagues raised concerns about the resulting model’s durability. Of course, there was that good old conservative notion that the normal inner workings of a shoe are best kept hidden. The resistance was so strong that there were already moves to remove him from the design team. Fortunately, Tinker Hatfield found an ally in Dave Forland, who was Nike’s Director of Cushioning Innovation at the time. The first Air Max was finally released on March 26, 1987, and it revolutionized the way the world would view sneakers. The Air Max 1 became the wind that Nike needed to keep its flight steady as it countered fierce attacks from competitors. The window idea paid off, and the shoe was merely selling like pancakes. The hype was probably because the new design wittingly added a unique touch to an otherwise old technology: Frank Rudy’s Air technology which had already been in use since the late 1970s as seen in other vintage runners like the 1978 Nike Tailwind and the 1981 Nike Mariah. Due to its success, the Air Max 1 single-handedly ushered in the Air Max era. In 1995, a memorable reiteration was dropped. Dubbed as the Nike Air Max 95, it was the first shoe that also had air cushioning in the forefoot area. Consequently, instead of having just one pair of display windows, it had three pairs: one in its usual place in the rear foot area, and two small ones in the forefoot area. The changes on the upper are also noteworthy. It featured a pattern that easily reminded observers of well-developed human rib cage muscles. The recent years saw the revival of the Air Max 95, but with a significant twist. In 2017, the Swoosh brand teased die-hard AM 95 fans with a winter-ready release. Re-imagined as a practical outdoor shoe that can combat the harsh cold, it now sports a high-top cut. The former running shoe that’s recreated into a sneaker-boot with layers of support got a new name, the Nike Air Max 95 Sneakerboot. The padded tongue is wrapped in neoprene that can be secured using a zipper. Once zipped, an additional lockdown is provided by a lacing system that sits on top part of the upper. Underneath, the feet are protected by the proprietary Nike Air-sole, while the outsole is lined with grippy and long-enduring rubber. The Nike Air Max 95 Sneakerboot takes the 90s fashion with a tasty twist by turning up into a high-top profile that’s also fitted for the winter months. Its curves are nostalgic of the vintage runner formulated by design genius, Sergio Lozano. The wavy design of its lacing system was taken from the anatomical shape of the human ribs. The composition of the outsole was derived from the structure of the spinal cord. Lastly, the combination of mesh and suede that comprises the upper resembles muscle fibers. The alternating shadows on the upper are like a magnified version of the human skin. The silhouette and overall feel of the Nike Air Max 95 Sneakerboot Triple Black suggests work and activity. Hence, this half-sneaker, half-boot model is best paired with work gears and athletic wear. The rugged aesthetics of this shoe plus its neutral black color scheme makes it suitable for various city terrains whether you pair it with cargo pants, overalls, and denim trousers, along with a reliable parka coat, wool jacket, or knitted top. This weatherized high-top sneaker is also perfect for those whose jobs require them to be outdoors most of the time. Indeed, this shoe is stylish as it is protective. The Nike Air Max 95 Sneakerboot Olive can be merged with straight-cut jeans, tactical pants and utility bottoms. Its shade complements dark blue, cement grey, and carbon black bottoms. This high-top Nike Sneakerboot, a tweaked version of the Air Max 95, is obtainable in men’s sizes extending from 7 to 14 US. Women purchasers who are interested in the look and function of this utility-structured shoe may have to obtain a pair that’s one and a half smaller than their usual size to achieve a desirable fit. Support is ensured through an effective lacing system and a secure zipper construction. The high cut form of this Nike sneakerboot offers added support and comfort while maintaining its flexibility. 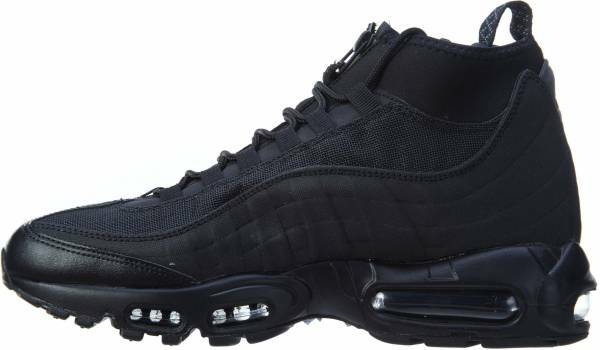 The ribbed upper is perhaps the most identifiable feature of the Nike Air Max 95 Sneakerboot. It effortlessly gives away the classic sneaker that the boot is based on. The lace-plus-zipper support system is also a unique feature. It makes apparent the shoe’s capacity to protect the wearer from the harshness of the cold weather. The bulky and segmented Air-sole cushioning system, a bladder of pressurized air found in the heel and forefoot, is another attractive asset of this casual everyday sneaker. This unit prevents hard impact from directly getting into contact with the feet as it compresses and expands in every stride, thus offering a smooth heel-to-toe movement. The inside of the Nike Air Max 95 Sneakerboot is lined with a heat-reflective material to provide maximum warmth, which makes it suitable for fall and winter. This shoe has a protective toe cap that is made of waterproof leather. The zipper closure for the inner sleeve keeps the feet snugly wrapped. A ghillie lacing system comprises the topmost closure. The heel area has a reflective detail that enhances visibility, especially during low-light conditions. A pull tab in the heel helps with the ease of entry or when taking off the shoe. The visible Air bladder offers lightweight comfort.